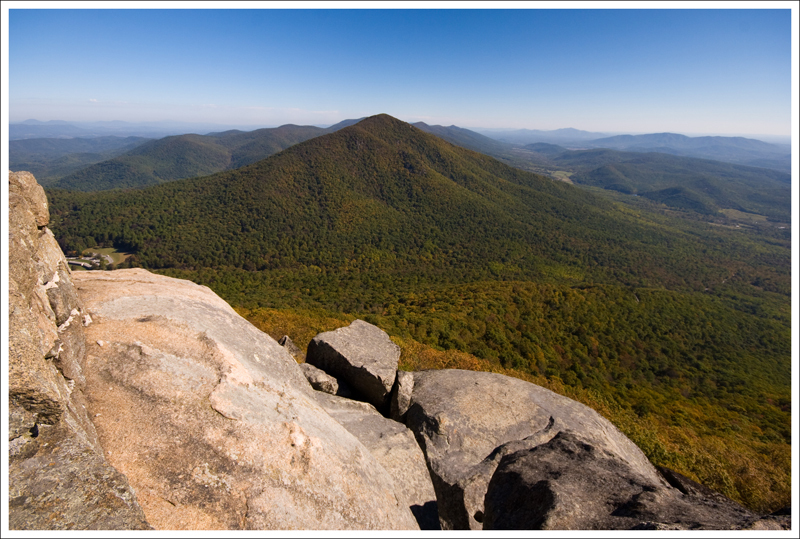 This 3.4-mile hike leads to gorgeous views from the summit of Sharp Top. You will be treated with gorgeous views of the area around you. The view from the Sharp Top Summit is gorgeous! 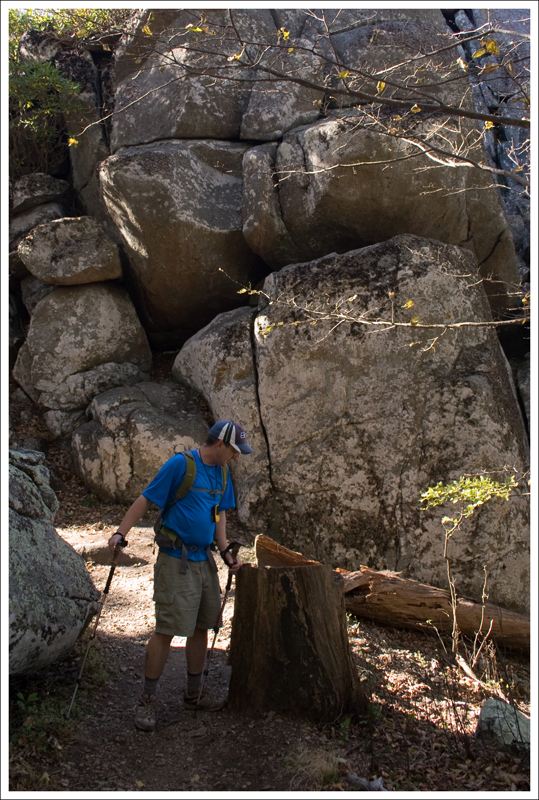 Below: Adam walks by some of the huge boulders along the Sharp Top trail; The trail is very rocky; A set of stone steps leads you to the summit; Looking back on Sharp Top mountain from Buzzard’s Roost. Sharp Top has such a special place in my heart. 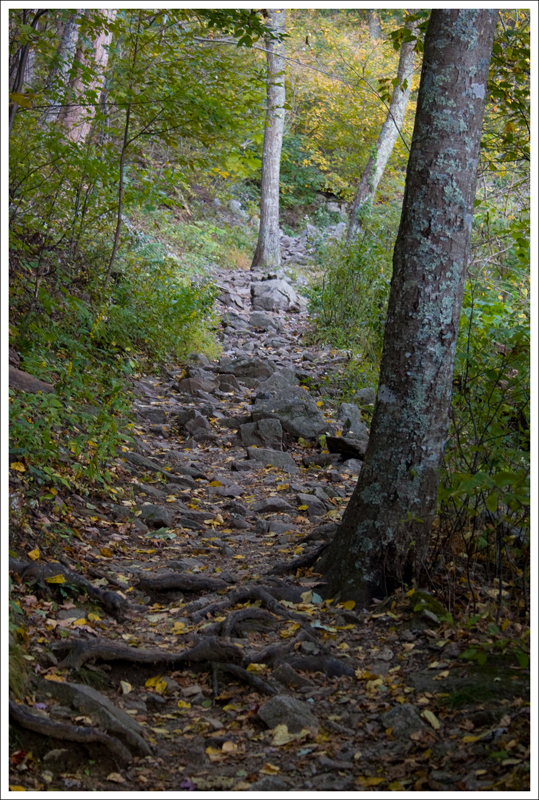 I grew up in nearby Lynchburg and I couldn’t even tell you the number of times I have hiked this trail. I went with family, friends, church groups, and scouts. My family used to regularly have picnic lunches at Peaks of Otter, so this is a place I’ve been visiting all of my life. On one hike with a friend I had growing up, we spotted some trail runners. Trail runners are common on Sharp Top most mornings. My friend had said he wanted to try and be in that good of shape, so we took weekly hikes up during one summer. We never made it up to the intensity of running the mountain, but it was some good exercise. Lately, Christine and I have made this hike a nearly annual fall tradition. I’ve brought my older brother a few times over the last few years. Each year, he seems proud to know that he can still “climb up that hill.” He was working the day we hiked it this year, so he didn’t get to make the trip. I’ll try to get him to haul his cookies up the mountain again next year. The Peaks of Otter Nature Center is the start point for this hike. Below: The trailhead sign; The Sharp Top bus takes riders close to the summit and is a great option for those not physically able to do the full hike; The trail starts off smooth and gentle – things soon change! This is an extremely popular hike for families and larger groups, but it definitely has some steep sections. However, most people should be able to accomplish this hike since it is only a three-mile round trip (the side trip to Buzzards Roost adds .4 miles). The trail starts off with a slow but steady climb and then crosses the bus summit road at .25 miles. Continue to climb up the trail which includes some sections of stairs. At 1.2 miles, you reach a junction. Continue left on the trail to the summit. The remaining .3 miles to the summit starts off relatively flat, but there are more sections of rock stairs along the way. 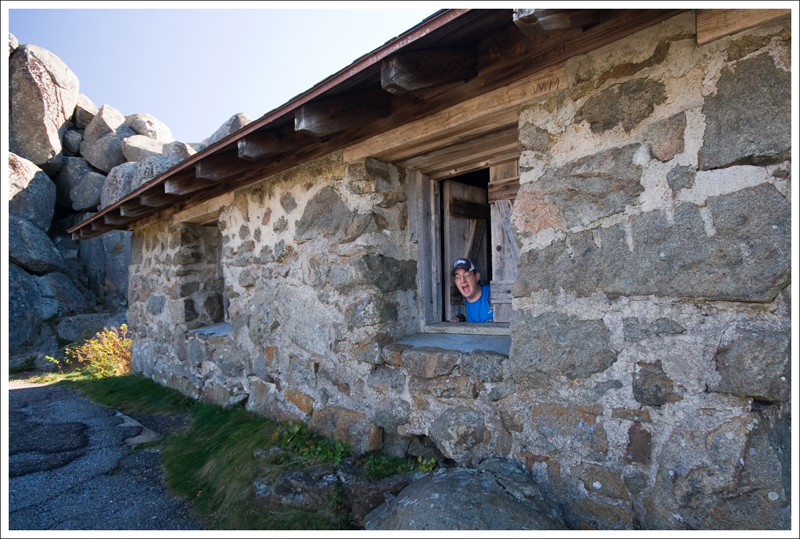 You will see a day-use only cabin at the summit and stairs to different platforms to soak in the views. You will see the Peaks of Otter Lodge and Abbott Lake to the North. To the South, you will see Turtle Rock (which some of the adventurous will find a way to climb up it) near the roof of the cabin. Go back the way you came. When you reach the junction .3 miles from the summit, I would highly recommend adding .2 miles (.4 miles round trip) to check out Buzzard’s Roost. The trail is relatively flat with minimal elevation difference. 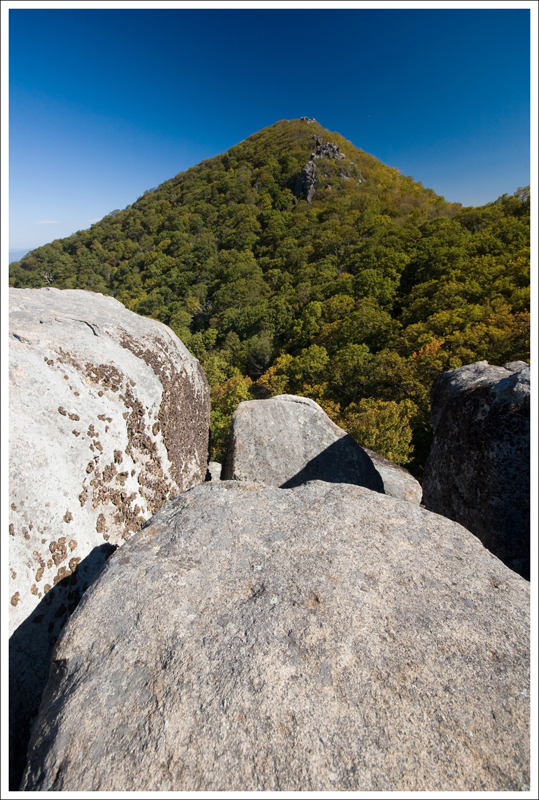 You will get more great views from here and can actually get some nice views of the summit of Sharp Top. Buzzards Roost does require some rock scrambling and carefully navigating around large rocks, so it isn’t for the faint of heart. Once you leave the Roost, go back to the junction and take a left down the trail to make your way back to the car. 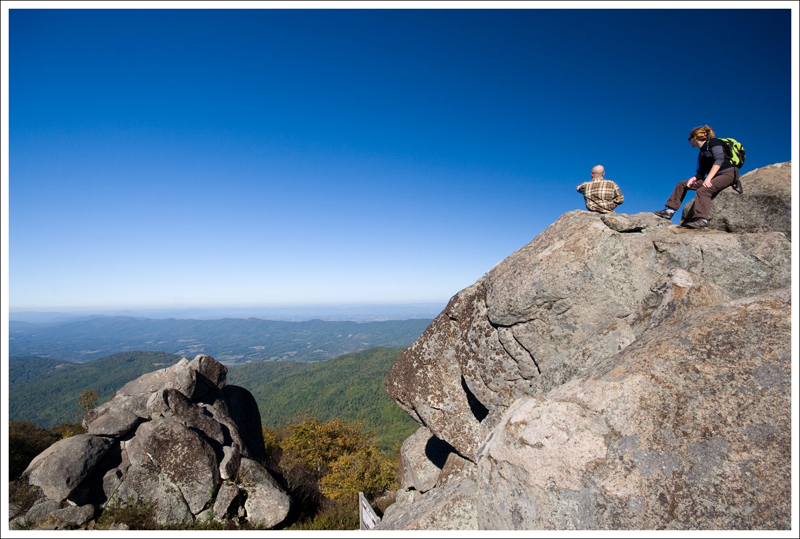 There are lots of places to perch on Sharp Top. Below: Adam makes his way up the trail; The trail has many stairs built into the rock; Adam on Turtle Rock. As I mentioned above, there are a lot of great places nearby for a picnic or you can dine at the Peaks of Otter Lodge. There is also a gift shop that sells sweatshirts inside that say “I Survived Sharp Top”. While I personally don’t think it is that difficult, I can understand some people feeling that way. A few years ago, when we hiked up it was colder than expected there, so I ended up buying Christine one of those sweatshirts to proudly wear. I’m so glad Adam introduced me to this hike. It’s a tough little climb, but the summit is spectacular. 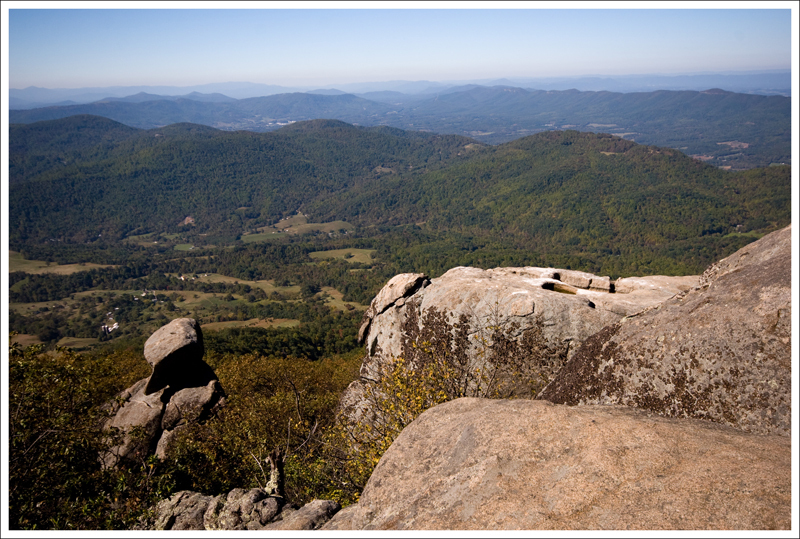 It’s covered with boulders the size of houses and has a view that rivals any Virginia hike. The one downside to Sharp Top is the crowd of people you’ll be almost guaranteed to see. It is indeed a popular place! A view of the mountain from the lodge at the bottom. 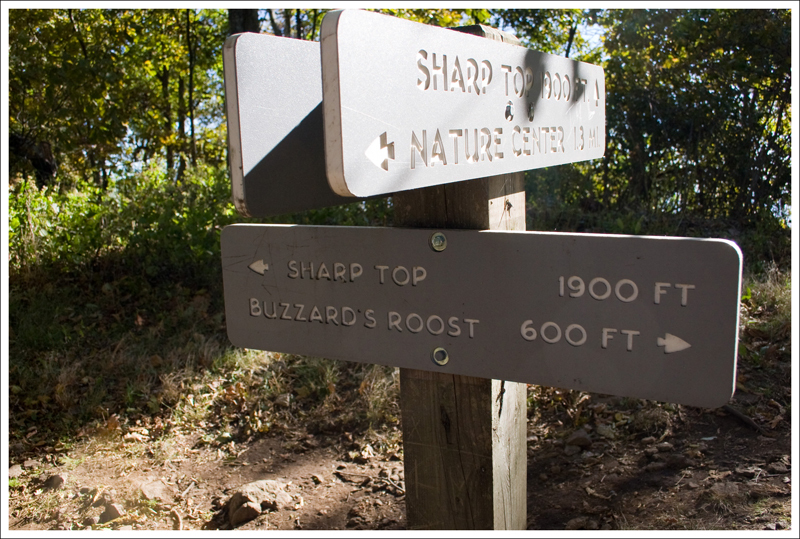 Below: A sign lets you know you’ve arrived at the summit; At this point you can turn and go to Buzzard’s Roost or continue to the Sharp Top Summit; Another beautiful summit view. We got a really early start on our morning, and were headed up the trail by 9:30 or so. It was cool and brilliantly sunny. Even though it was the second weekend of October, the leaves were still mostly green. 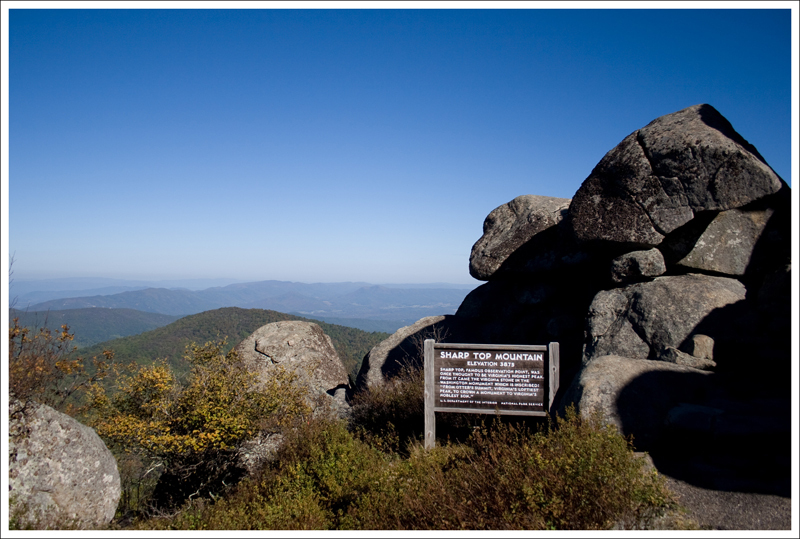 That was a little disappointing – I had hoped to hike Sharp Top at the peak of fall color. We’ve done that in past years, and the foliage makes the view even nicer! As we hiked up the trail, we passed several downhill hikers on their way back from watching sunrise atop the summit. Other than that, we had the trail mostly to ourselves. The uphill grade starts of gently, on a mostly smooth and wide trail. For some reason, this is always the only part of the Sharp Top trail I remember. I don’t know why, but I always seem to block the steep and rocky parts out of my mind. After you cross the bus road, the path gets a lot tougher. It’s fairly relentless uphill for a while. Periodically, there are reprieves where the grade moderates and you get a chance to catch your breath. But after each little flat spot, you’re guaranteed to have more climbing. 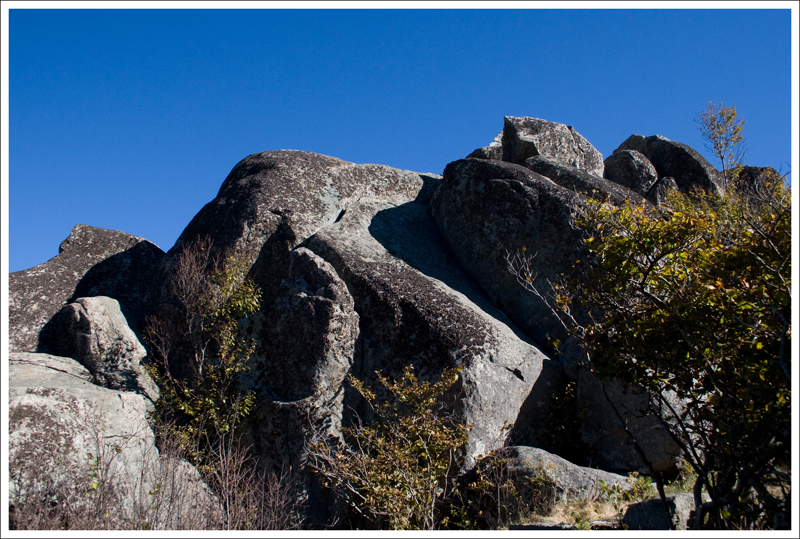 As the summit draws near, you’ll find yourself hiking between and around gigantic boulders. The rock formations on this mountain are impressive! Near the end of the trail, there are quite a few stone stairs to climb. Almost immediately upon reaching the summit, you’ll pass the cabin. The inside is an empty room – concrete floor, fireplace and small windows that look out to the view beyond. It apparently used to be a concession stand. I’m glad someone thought better of the idea and closed the place down – do we really need hot dogs and ice cream for sale on mountain summits? 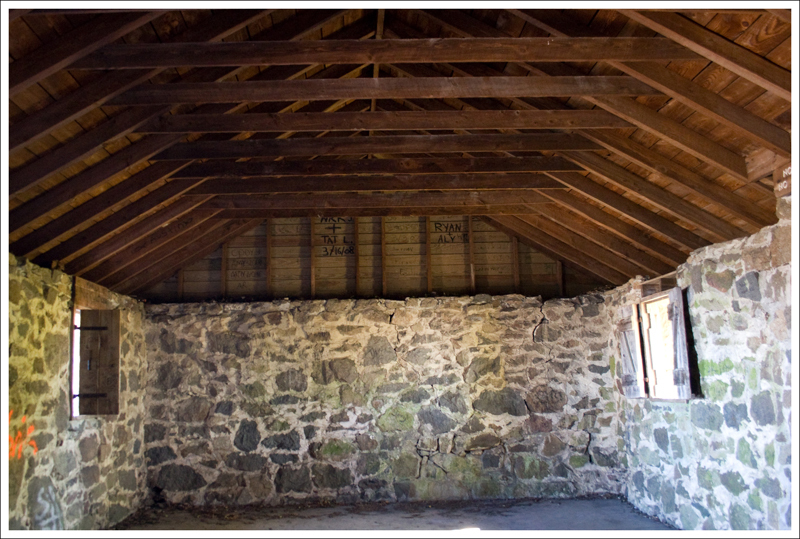 The empty building on the Sharp Top summit. Below: Inside the summit house; A boulder jumble at the summit; View of mountains in the distance. 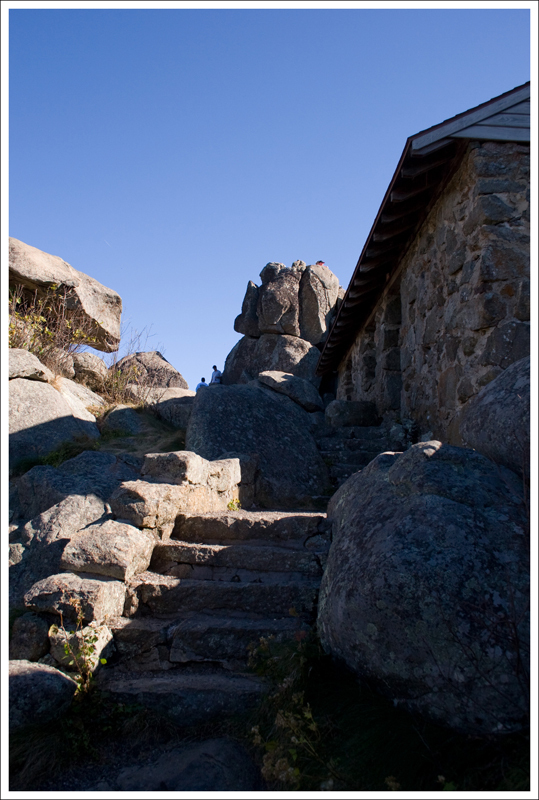 After passing the building, the path winds between the stones up to the highest spot. All over the summit, there are small alcoves and large rocks to perch upon to take in the view. Unless you started very early, the mountain will be crawling with people who took the bus ride to the top. You can usually spot the bus crowd easily – they’re never sweaty and are often wearing dressier clothing and insensible shoes. 🙂 Hikers seem to enjoy quietly referring to the bus riders as “cheaters”. I think it’s great that a bus ride is available for people who aren’t physically able to hike up, but I see lots of young families that I wish would give hiking a chance. On the way down, Adam and I took the side trail to visit the Buzzard’s Roost. For some reason, this was the first time I’ve taken the option. The roost had amazing views, but I did not enjoy climbing up the rock. I had an inner ear virus a few years ago, and have suffered serious bouts of vertigo ever since. Anytime I climb places with uneven footing and precipitous, open drops I get an awful spinning sensation. It’s like the feel of my feet doesn’t match what my eyes are seeing. It’s a very strange sensation. Sometimes I start to panic, but I’ve found that if I stay low to the ground and go very slow, I can always manage to get where I want to go. But needless to say… you’ll never find me doing any serious rock climbing! Adam takes in the view from Buzzard’s Roost. Below: Another view from Buzzard’s Roost. After the stop at Buzzard’s Roost, we started our final climb down. I was so glad to have my trekking poles on the steep, uneven ground. So many upwards hikers commented on them! Everything from “We thought you were skiing down!” to “Why do you have two hiking sticks?” to “Darn… I wish I remembered to bring my trekking poles!”. I was surprised so many people had never seen trekking poles before, but I suppose Sharp Top has a very high percentage of people who aren’t regular hikers. Personally, after using trekking poles for a while now, I don’t know how I ever hiked without them! The hike down was over pretty quickly and we were off to lunch! Typically, we pack a picnic – but this time we decided to try the restaurant at the Peaks of Otter Lodge. They had a buffet option, but it was really expensive and there was no way I could have eaten my money’s worth. But I have to admit… that mountain of fried chicken on the buffet table looked very compelling! We settled for sandwiches instead. After lunch, we walked along the water and did a bit of people watching. I even saw (allegedly) an otter swimming across the lake. Distance – 3.4 miles. You can make it just 3.0 miles if you don’t do the Buzzards Roost side hike. Difficulty – 3. 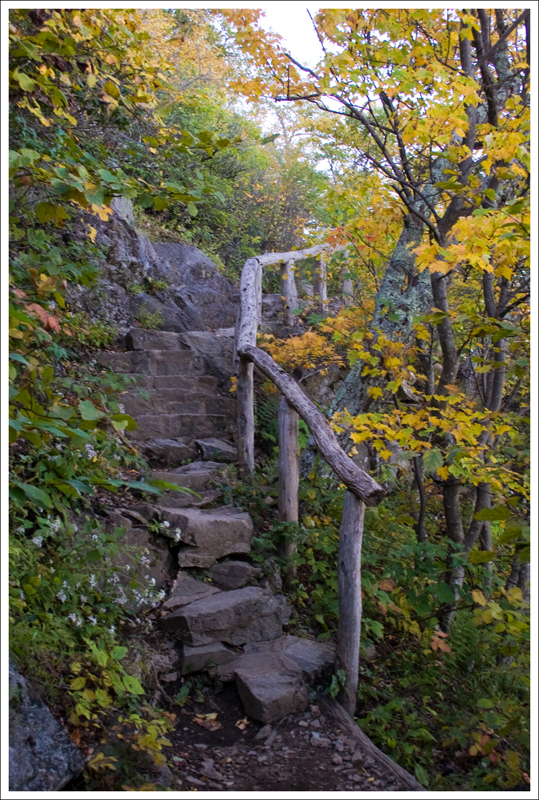 The hike is fairly steep most of the way, with a number of stairs to climb towards the middle and end of the trail. The hike to Buzzards Roast does not have much elevation change. 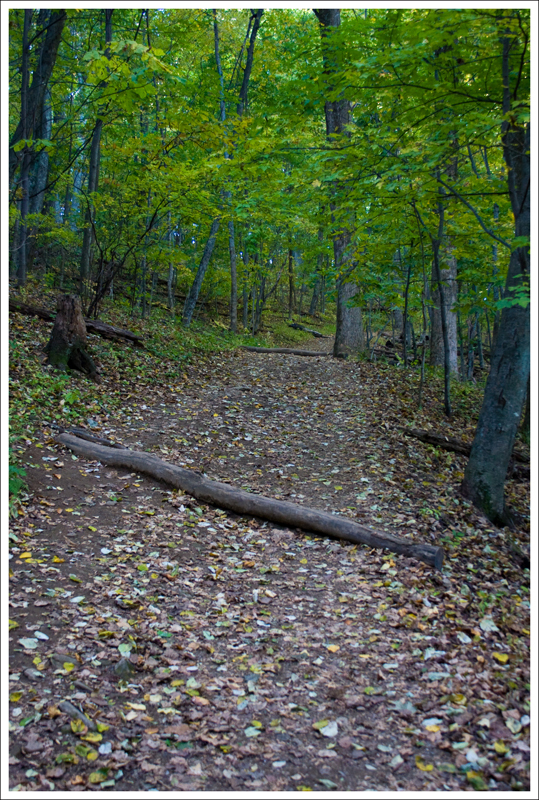 Trail Conditions –3. The trail is well-maintained, but there are a number of sharp rocks that can make footing tricky. Views – 5. 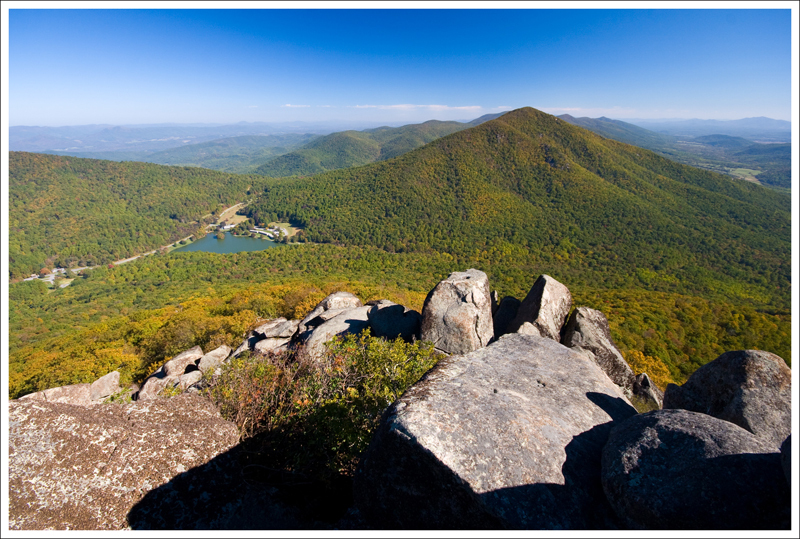 Amazing 360 degree views from the summit give you some of the best views in Virginia. Go up on a clear day and you will see for miles. Wildlife –1.5. Due to the popularity, you will likely only see birds. You may spot soaring hawks at the top. Ease to Navigate – 5. Trails are well-labeled, so you shouldn’t have much difficulty navigating the area. Solitude – 0. 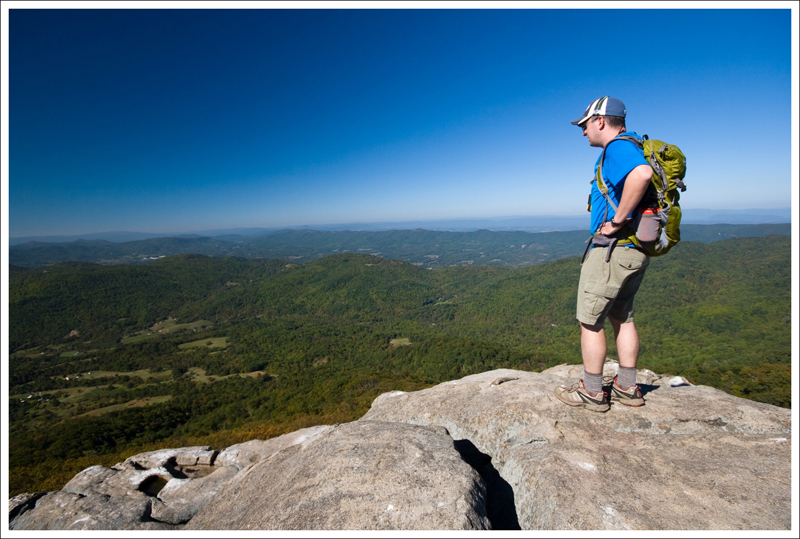 This is one of the most popular hikes in Virginia. To escape the crowds, go up early in the morning. 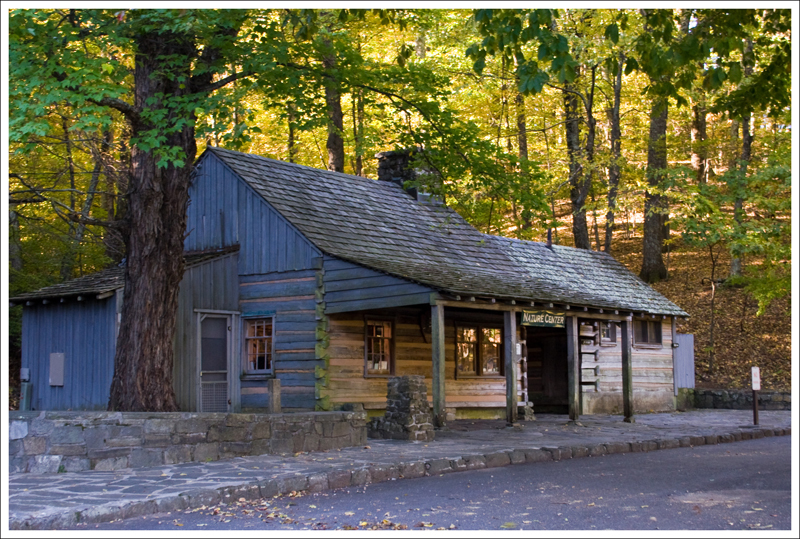 Directions to trailhead: The trail begins near mile marker 86 on the Blue Ridge Parkway. The trailhead is to the left of the nature center, which is directly across from the Peaks of Otter Visitor Center. I discovered you blog just a few days ago. I wish I did it sooner. It’s great and so helpful. Thanks for sharing! We are visiting VA for three weeks staying in Vesuvius. 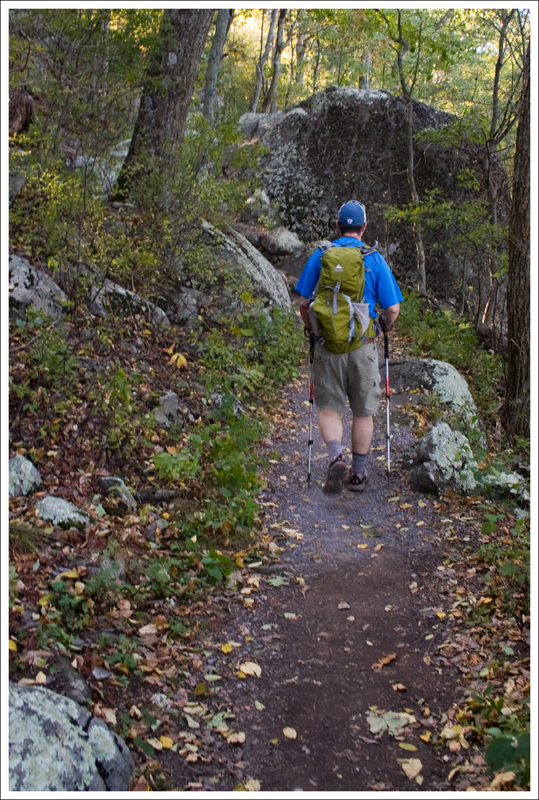 We’ve done already Crabtree Falls, Spy Rock, Humpback Rocks, Natural Bridge, part of Whetstone Ridge. 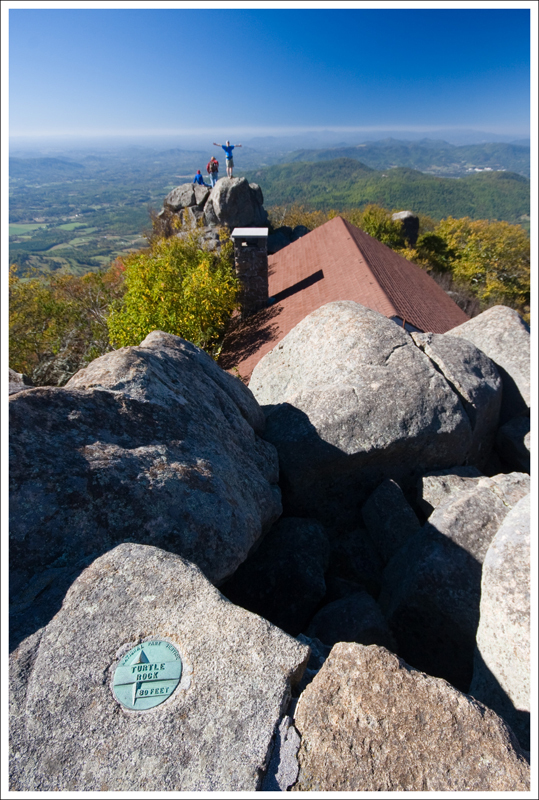 Our favorite so far is Humpback Rocks and we are looking for some other hiking/ scrabble/ climbing ones. Any suggestions? 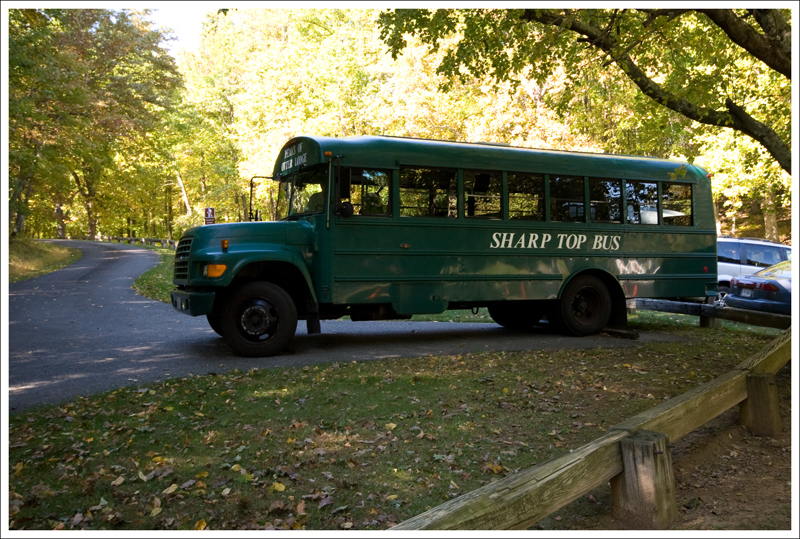 Question about Sharp Top- is it 3.4 mile round trip or one way? Thanks for the visit! 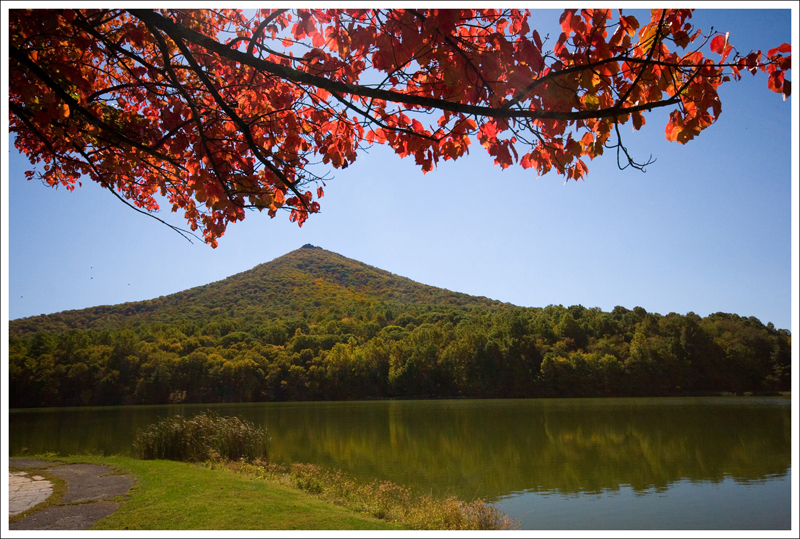 Sharp Top is 3.4 miles round-trip. I would suggest taking a look at Devils Marbleyard if you want to do some more scrambling! Is there a way to drive up to the top? This was very helpful thank you so much. We go in two weeks to sharp top. Can’t wait To hike it . Coming all the way from the Florida keys . We have a 4and 6 year old girls. What’s ur recommendation on them hiking all the way up? If your kids are fit and active, they may be able to do the entire hike. But, you can also consider the bus ride to the top. You’ll still have a short hike from the bus drop-off and lots of rocks to scramble on and views to enjoy! Are pack animals (pack goats) allowed on this trail? I know they are not on the Appalachian. 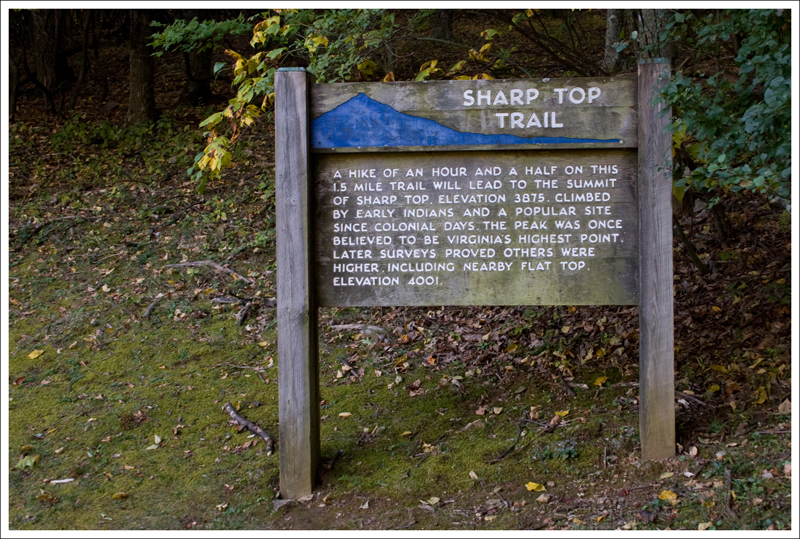 Were can I find trail rules for the Sharp Top? Here are trail regulations. I don’t see anything specifically about pack animals, so you may need to call/email to inquire specifically. I’ve never seen horses/mules on that trail, so my *guess* is that pack animals are not allowed. So I have done research on where this is and several of my friends are going to go in march. I was hoping that someone could tell me if it is off to the left or right of buzzard roost trail and how far down the buzzard roost trail should I go. I understand that people dont want this to be known to the public but if someone could e-mail this info to me at ml18tcs@yahoo.com I would appreciate it. I believe waymarking.com has the precise coordinates. I might suggest looking there. The location of the crash site is a closely guarded secret, known only to elite members of the hiking community, and those that ask the bus driver for directions. Thanks for the interesting read. I had no idea that this hike is a very popular one, though I can see why. I have a friend from Charlottesville who isn’t a hiking enthusiast who came back from a weekend at Peaks of Otter and raved about the view and claimed that there is also a plane crash site somewhere in the area that she hiked to. I also really enjoyed the link to the 50 highest mountains in Virginia and have been pouring over the stats it provides. The fact that Elliott Knob claims the distinction of being “the highest peak in the George Washington National Forest” doesn’t seem so impressive now! Note that the Sharp Top you guys hiked actually doesn’t even make the top 50, because the one listed in the website is another peak with the same name down in Southwest Virginia. 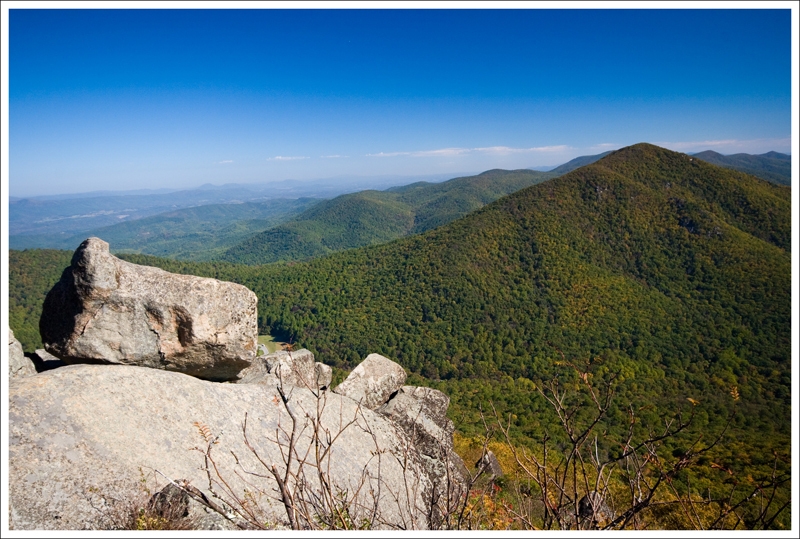 Amazingly, Hawksbill, the highest peak in Shenandoah National Park, can’t make the list either.